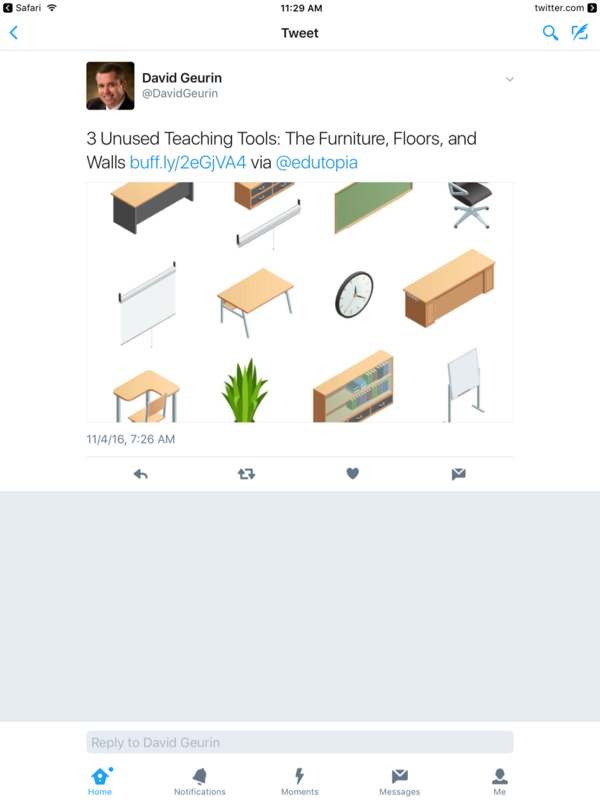 David Geurin pointed me to Edutopia to learn about 3 Unused Teaching Tools: The Furniture, Floors, and Walls. Johnson, the author of the post, points out that the first underutilized spaces are the desks, chairs, and other furniture in the classroom. The set-up of Johnson's tour bus classroom was not the traditional straight rows facing forward, nor was it the collaborative grouping of four to a table that is normally used. The arrangement of the desks got changed because the teacher had a particular purpose that changing the seats would facilitate: Straight rows lend themselves to giving the teacher more control over student behavior (reducing talking). They also help students to focus on the side of the room they are facing. When the teacher (or students) are presenting, this is ideal. Debates: Split the class and put the desks on opposite sides facing each other. Jigsaw (where your students move around, teaching each other): Set up stations in the corners of the room. Paired work: Desks can be face-to-face or you can do double pairs—four to a group. Socratic Seminars: Create an inner and outer circle with your desks. 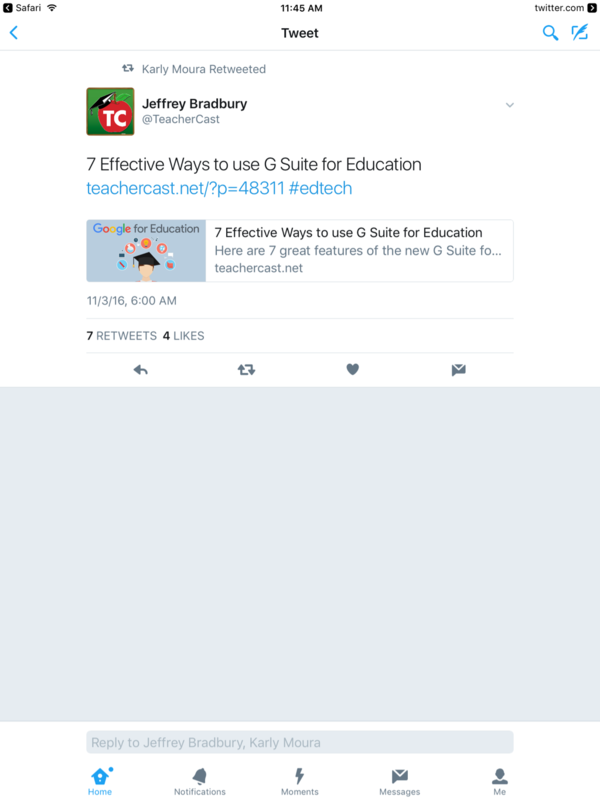 Karly Moura pointed me to Teachercast for a demonstration as to 7 Effective Ways to use G Suite for Education. Google Apps for Education is now “G Suite” for Education. Google has not just changed the name of its popular offering, but it has also added new exciting features. Those who have used Google Apps for Education love the set of Apps such as Gmail, Drive, Docs, Hangout, Calendar and more. These applications have helped schools, students and teachers in several ways. ​Google has introduced ‘Explore‘ feature in Google Sheet to overcome the challenge of entering formulas incorrectly on a webpage. The Google Sheet will understand your natural language to complete the task. You write a question in your natural language and Google Sheet will automatically apply the right formula. This feature will save a lot of time. Students can focus more on solving real world problems. Preparing a presentation is an exhausting task for students. It involves creating content, formatting layouts and inserting design elements to bring life to the ideas. Today, students spend more time in designing the presentations than preparing the content. G Suite for Education addresses this problem by suggesting the presentation layouts based on the content. In few clicks, students can design beautiful presentations. The best part about this feature is machine learning. The Explore will continuously learn and become better over time. So, with time, students will save comparatively more time in future than that in the present in designing the presentations. Google is adding Quizzes in Google Forms. Teachers can easily grade students with this additional feature. Moreover, teachers will know about the questions that students are finding difficult to answer. Quizzes combined with Explore in Google Docs will make regular assessment super easy and fun for teachers as well as students. The students will have clear insights about their learning progress during the course. Use a common calendar for your students so that students don’t have more than two quizzes, tests, or projects due on any given day and also not after a large evening school event. Only give homework that requires original thought and a meaningful product, not simply the consumption of paper. 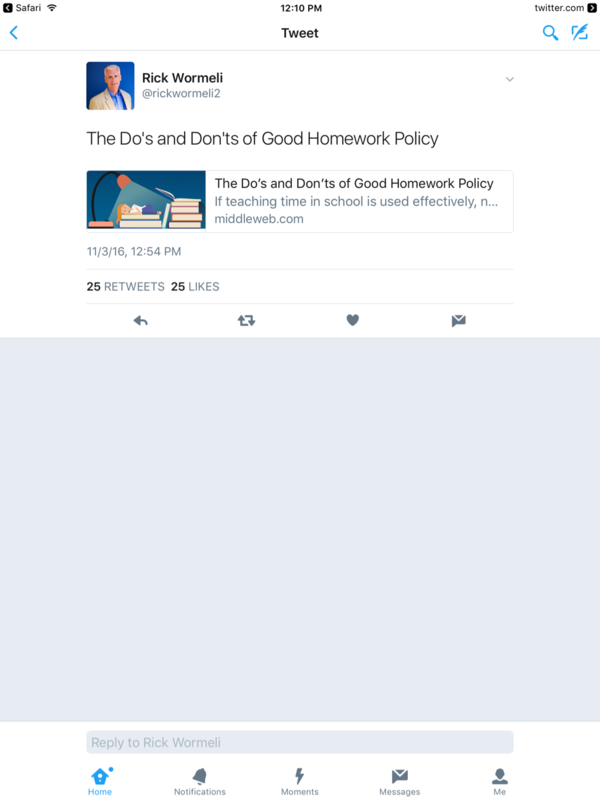 Reduce homework by using my class time as effectively as possible. If there is vocabulary they need to know, for example, work with it often and in many different ways in order to cement the information in their brains. Don’t use the memorization of vocabulary as homework because then it is in and out of their brains quickly. ​Use homework to introduce a new concept. If students are learning the concept on their own, then they are teaching themselves, what is your role as an educator? Never give busy work, especially as homework. Grade homework for correctness. Rather, give a few points for completing homework, but homework should never count for more than 10% of the student's final grade.